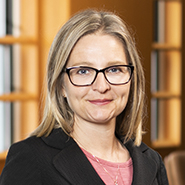 Toni Hoverkamp is counsel in Herrick’s Real Estate Department. Toni represents purchasers, sellers, lenders and borrowers in commercial real estate transactions in and around New York City and Long Island, NY. She works with private developers and investors in joint venture negotiations, landlords and tenants in leasing transactions and has represented numerous purchasers and sellers of high-end residential properties. Toni also advises clients in a variety of areas of condominium and cooperative law, including the representation of developers in the preparation of offering plans for new condominium construction projects, landlords and tenants in the creation of leasehold condominiums, and sponsors in the preparation of condominium and cooperative documents. Toni has extensive experience working on real estate transactions on Long Island, including working with a Long Island developer in connection with the assemblage of properties for a condominium development. Her diverse experience in New York City includes the representation of a REIT in connection with the sale of a portfolio of former gas station properties, and the representation of a major U.S. institutional lender in several multi-million dollar mortgage loan transactions. Toni returned to Herrick after working for Farrell Fritz, P.C. for many years.